“Why I like this book: Michelle Kadarusman has crafted a richly textured story about [Alba], who has a leg that is directionally challenged. It is a powerful and captivating story about differences and abilities and ‘learning to love who you are and what you can do.’ It is emotionally honest and filled with heart. It is important for readers to see themselves in realistic characters like [Alba]…. The author’s use of hummingbirds as a poignant metaphor to help Alba embrace her life in a meaningful way and pursue her big dream. ‘Hummingbirds don’t sit around moaning about their tiny feet and that they can’t walk,’ she says. Like [Alba], the author was born with talipes equinovarus (CTEV), more commonly called club foot. 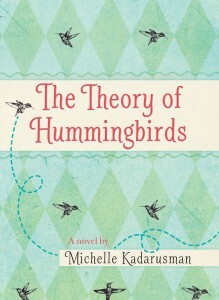 The Theory of Hummingbirds will be “appealing to a wide variety of readers” says Librarian, Kathie M.